A friend of mine asked me to watch a documentary called Kumaré to see what I thought about it. You can watch it too at http://kumaremovie.com/. I would love to hear your impressions. Somehow I missed it when it hit movie theaters in 2012. But it is really a very important work on spirituality and religion! 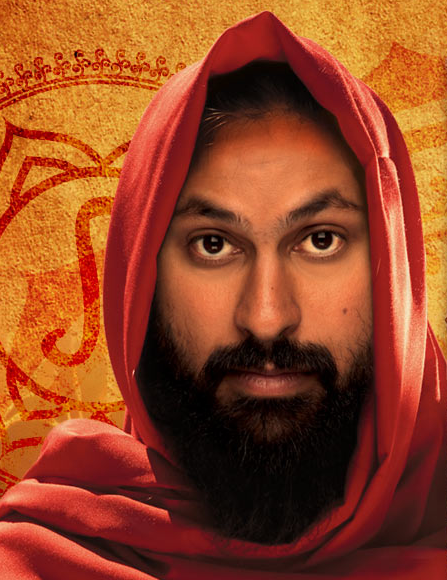 Filmmaker Vikram Gandhi, impersonates a fake guru and intentionally builds a following of real people in Phoenix, Arizona in hopes of discovering if spirituality and religion are real experiences or simply manufactured. Vikram grows out his hair and beard, dresses like an Eastern guru, adopts his Indian grandmother’s accent, carries a unusual staff, holds spiritual classes at the local yoga studios, and visits other gurus. The followers he gathers are a fairly diverse group of mostly very intelligent people. One of the amazing aspects of the documentary is that the more he gets to know his followers, the more compassionate he becomes towards them. He finds himself wanting to help them with their problems. They become very special to him. Meanwhile, he is developing a set of teachings to teach them. Actually regretting his farse, he brillantly succeeds in making his teachings as close to the truth as he understands truth. He teaches them that he is a illusion – that all gurus are an illusion. That people are their own teachers and must teach themselves. In the end, after 3 months of intensive interaction with fourteen of his followers, he reveals the truth of himself to them with rather surprising results. You’ll have to watch the documentary to see the reveal. I don’t want to give it away. But the question that this experiment brings up for a Christian is: What if Jesus was a fake guru? What if our following him was no more real than these students following Vikram? What if he was just a real good guy who loved us? There was one thing that Vikram and Jesus had in common: They loved their followers. But I use the word “love” here losely. Vikram’s love is easy, always affirming. It didn’t require much of Vikram or his followers. He never went the extra mile to get his hands dirty and serve them in practical ways. His love wasn’t tested with hardship or choice between serving himself and serving his followers. Vikram’s love was simply a mirror that always pointed them back to themselves. Jesus’ love is very different. It is unconditional – given to followers and enemies alike. It is not always affirming, but sometimes it painfully judges us and corrects us. Jesus’ love requires much of Jesus – he endures hate, violence, even death. Jesus’ love was tested and survives more than 2000 years later. Jesus’ love points us not to ourselves or even back to himself, but to reconciliation with God and others. Jesus’ love was spoken of thousand of years before his birth. Jesus is still the real deal to me! I think it’s a really interesting concept that the movie puts forth. It’s brings up and challenges a lot of things, which I think is a good thing so that we don’t become complacent. I agree with what Z.. said; “that if it makes us better people in the short and long run, then does it really matter? ” (Paraphrasing of course) I know that a lot of my beliefs have changed over the years, whilst my older sister’s have stayed firmly the same and resolute. I don’t knock this in her, because it is the strength that she needs and gets from her beliefs that helps her to keep going and deal with a tremendously difficult life situation she is in. I think that the people who take a scripture reading and twist it to their own “want to be hateful” causes. They use God’s name, but God has nothing to do, nor wants anything to do with their hatred, which is humanly produced, not spiritually. There is no spirituality in hatred. Jesus Himself clearly pointed out that we are to love one another, be there for one another, help one another, etc, etc,… Never did he speak of having hatred in our hearts towards others. He taught us to hate the sin, but love the sinner; not to persecute and torment people. Everybody needs to believe in something, and I think that Documentary points that out very well, because those people were just so hungry for a spirituality that would “fit” them and accepted whatever the Guru said because they were also desperate for someone to love and guide them; just as Jesus did His disciples. The big difference between Kumare and Jesus is that Kumare was only capable of loving with Philia love, because of His human state of being; whereas Jesus loved with Agape love, which is all en-composing and the real deal. I especially like what you say Ingrid about Philia love versus Agape! Thank you for sharing everything! And I wonder how it is that so often – especially within the church – the teaching of Jesus’ love is turned into a message of hate? What if Jesus, and even God was an illusion!! It is the message and the effect it has on people that matters the most. If the belielf makes us better people and leads to love and compasion then it is good in either case. On the other hand, if the teachings are used to promote hate for others, then real or illusion become a moot point.